Editor's note: Emily Waldon will be providing regular minor league recaps from the Arizona Fall League and International play to keep you updated on what's happening in the Tigers' farm system during the offseason. Be sure to follow Emily on Twitter at @emilywaldon2080! While many teams have closed the book on their regular season and headed home for the offseason, a handful of players from each major league team headed west to participate in the two-month Arizona Fall League. Almost a year after helping lead the Scottsdale Scorpions to a League Championship title, the Detroit Tigers sent seven representatives back to the desert to take part in the extended season play. After a dominating regular season at the plate for High-A Lakeland, the late season promotion to Double-A Erie for the former Tennessee outfielder came as no surprise to anyone. Over the course of his first four outings with Salt River, Stewart has been held to 2-for-16 at the plate, including (surprise, surprise) a three-run blast in just his second game with the Rafters. Eight strikeouts in his 16 plate appearance have Stewart hitting .125 with a trio of RBI, in addition to his signature home run. The Gamecocks alum joined in the carousal of promotions during the regular season seeing time behind the dish at the High-A, Double-A and Triple-A levels in the Tigers system. Since landing with the Rafters, the gargantuan backstop is hitting and hitting well. With a pair of starts, Greiner stands 3-for-6 at the plate, boasting a pair of doubles, a home run and four RBI. Jones returned to Arizona this fall with a little extra bounce in his step, following his September call up to the Tigers. Surpassing expectation in his debut, Jones dazzled with four hits and three doubles in his first two games in the English D. For the Rafters, Jones has produced once again, hitting in four of his first five games back in Arizona, including multi-hit outings in three of those four. 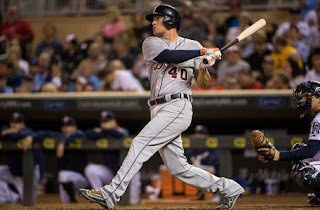 Not to be overshadowed by his Tigers organization teammates, Jones cleared the fence in his third game with Salt River, adding 5 RBI and a pair of doubles overall. Following his promotion to High-A Lakeland for the 2016 season, the goal for Spencer Turnbull was returning to top form, following an extended visit to the disabled list to start the year. Handed the ball for just one start to date for Salt River, Turnbull submitted three innings of work for the Rafters, allowing two runs – one earned off five hits, while walking one and fanning a pair. A shorter outing for Turnbull doesn't come as a shock, considering his first seven starts with Lakeland didn't surpass four innings. Safe to say, health remains a focus for the big righthander. Ravenelle has been a bit more active from the relief side of the Salt River pitching staff, already posting three appearances in the books for the Rafters. The former Vanderbilt fixture has been next to perfect over his three hitless one-inning shutout performances, earning a pair of saves for Salt River, as well as allowing just one walk overall. Ravenelle split his regular season between High-A Lakeland and Double-A Erie, earning a combined four saves and an overall ERA of 3.88. Following the majority of the regular season spent in a starting role with the High-A Lakeland pitching staff, Jeff Thompson has taken a different role since making his Arizona Fall League debut for the Rafters. After submitting 118 2/3 innings of work for the Flying Tigers, the pair of appearances out west for Thompson have been limited, each only an inning on the hill for the Rafters. The 2013 3rd round pick for the Tigers has surrendered one run off two hits, tying in a pair of strikeouts in his two total innings. A member of the Midwest League Champion West Michigan staff from 2015, Lewicki was among those making the shift south to join the Flying Tigers in Lakeland. Following 21 2/3 innings for Lakeland, Lewicki was on the move again, this time to Erie. With the SeaWolves staff, Lewicki went 1-7 with a 3.48 ERA over 12 games. Stepping out of the starting role, Lewicki has submitted two short-lived relief appearances, combining for 2 1/3 innings for Salt River. In his debut relief appearance, Lewicki was awarded the victory, moving to 1-0 on the year. Overall, Lewicki has allowed four runs – three earned off six hits and fanning a pair since arriving with the Rafters. · Activity has kicked off in the Venezuelan and Dominican Winter Leagues, as well as the Australian League looking ahead to begin their season with an exhibition contest on November 7. Stay tuned for updates next week as all the International clubs get settled into full season action with more updates to come. · Resident flame thrower Joe Jimenez confirmed he will not be participating in Winterball with his native Puerto Rico, mentioning instead of his talks to possibly suit up for the World Baseball Classic with Team Puerto Rico. Current plans for Jimenez include a trip to Los Angeles on Friday, where he will spend a month with his trainer to begin his offseason work.